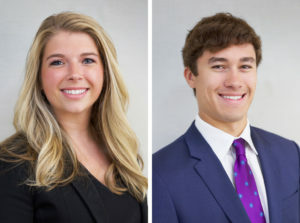 BALTIMORE (August 27, 2018) – Brooke Harlander and Angelo Munafo have entered the St. John Properties, Inc. Partner-in-Training Program, a four-year sequence that mentors and educates individuals in every aspect of the commercial real estate process including construction, marketing, leasing, development and tenant improvements. Upon graduation, the professional typically opens a St. John Properties regional office in a new section of the United States that the company considers a major growth area and development opportunity. 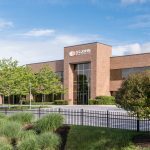 Headquartered in Baltimore, St. John Properties is a full-service real estate development, investment and management company operating in eight states. Four professionals have completed this program in the past, and three are now currently enrolled. Brooke Harlander joined St. John Properties two years ago and is presently a Retail Leasing Representative where she assists in the leasing and lease renewal activities for the company’s two million square foot retail portfolio throughout Maryland, Pennsylvania and Northern Virginia. Ms. Harlander graduated with a M.S. in Real Estate and Infrastructure from the Edward St. John Real Estate Program at the Johns Hopkins University Carey Business School. 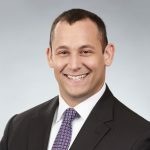 Angelo Munafo recently earned a Bachelor of Science degree in Economics from The Wharton School of the University of Pennsylvania and completed an internship with the company during the summer of 2016. 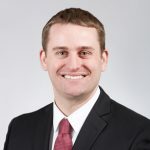 Daniel Thomas was the most recent graduate of the Partner-in-Training Program in 2014 and subsequently opened a new regional office in Salt Lake City, Utah in 2015. Over the past three years, Thomas has overseen the development of more than 425,000 square feet of commercial office and retail space. Earlier this year, the Utah office delivered a six-story, 195,000 square foot commercial office building, which represents the single-largest building in the St. John Properties portfolio. An additional 380,000 square feet of space is currently in the development pipeline in Utah. Over the years, regional offices have been opened or are currently managed by Partner-in-Training Program graduates in Colorado, Louisiana, Northern Virginia and Central Maryland, Utah, and Wisconsin.